“Do you mind if I interview your little boy for The Washington Post?” asked a sandy-haired man in a jacket of the same color. We were all standing in front of the gates of Nationals Park as crowds were streaming in for the opening game of the season. Dante was wearing a bright red National cap embroidered with a “W,” and was looking very much the part of the young baseball fan. I looked up at the reporter and told him we were still looking for a pair of tickets. It was a beautiful day, the best you could hope for on April 1. The sun was out, temperatures were in the low 60s. It was the exact opposite weather I expected for Opening Day, which is one of the reasons I hadn’t bothered to order tickets in the first place. When I realized that Dante had the day off of school, I made a decision mid-morning that we would take the Metro down to the ballpark to see if there were any standing-room-only tickets. “Maybe we will get lucky,” I thought. The reporter looked at me blankly, clearly wondering why he wasn’t the one asking the questions. The journalist had struck out. He was there to report on the excitement of Opening Day at National Park and our twin sob stories of a boy with autism having no ticket to get into the stadium were not what he was looking for. As the game started, we still had no tickets. By this time, I had asked about available tickets at the ticket booth, “The cheapest one we have is $105.” I had also strolled up and down the path in front of the ballpark looking for scalpers. I had seen a few solo fans trade cash for bar-coded computer print-outs, but I had no idea what the going rate was. Ticket scalpers tend to avoid mothers walking around with their six-year-old sons looking for tickets; we certainly don’t look like big spenders. When one scalper finally sidled up to me and asked me what I was willing to pay (“40 bucks?”), I proved his theory. Dante was really agitated at this point and it was all my fault. The one thing autistic children don’t like is a change in routine. While Dante had gotten used to the go-with-the-flow days of Spring Break, I had known to give him a schedule to anticipate. At the beginning of this day, I told Dante we would 1) take the train down to the stadium, 2) TRY to get tickets and 3) IF we got tickets we would enjoy the game but, if not, we would have seen the stadium and had a fun ride on the train. Inserting that conditional was where I went wrong. Dante just didn’t understand why we didn’t have tickets. “WHY DON’T YOU HAVE ANY TICKETS?” With this final question, Dante balled up his fist and made contact with my upper arm. Then he kicked me in the shin. It was typical Dante-at-the-end-of-his-rope behavior. Roars came from the stadium. Bryce Harper had hit a solo home run. Tens of thousands of people were cheering within yards of our desperation. This was our last chance to score tickets. I walked slowly with two fingers held aloft, a technique I’d picked up by watching other fans and scalpers prior to their transactions. No sooner that I held up my fingers, I heard an older man’s voice to my left. “Well that motion is illegal in these here parameters.” He created a wide rectangle outline with his fingers. As he’s telling me all of this, I notice at least three other people with their fingers in the air. “You’re right. Just don’t get caught in these parameters,” warned the policeman, as he turned to explain the rules to another passerby. “Well, I think we’re just going to have to go home, Dante,” I sat at I slumped down on the sidewalk. The lack of tickets, the frustrated boy, and the stern warning from the pasty man in blue suddenly weighed on me and I began to bawl. “I’m really sorry, Dante. I thought this would be fun for you.” I lifted my sunglasses and rubbed by eyes, but I couldn’t stop the tears. “One more time!” Dante started singing his favorite song of the moment, “One More Time” by Daft Punk. I gave him a teary smile, stood up, and we walked about fifty steps back to the big blue gates of the stadium. By this time, hardly anyone was milling about, either outside or inside the gates. Ticket holders had found their seats, so we could see the large screen television right inside the entrance. My tears had mostly dried by this time. But I was still wearing my sunglasses on my head and I could tell my eyes were red. As I was pointing out the television to Dante, a woman just inside the gates said, “Excuse me.” I looked over to see an exceptionally pretty girl with long black hair and already-tan skin. She was wearing a long sleeve blue shirt, denim shorts, and sandals. “Do you need a ticket just for him?” she asked. “No, we need two, unfortunately,” I told her and shrugged my shoulders at our misfortune. The girl paused for a second, then reached her arm through the gates. “Here,” she said, as she presented two tickets. These were not the wrinkled, computer print-out tickets I’d seen most people walk through the entrance with. These were tickets emblazoned with the team logos, date, and time. These were souvenir tickets. No one but Dante was around to witness this miracle transaction. We walked about five feet to our right, where stadium staff were helping the stragglers check in. We scanned our tickets and we were good to go. Within five minutes, our luck had changed dramatically. 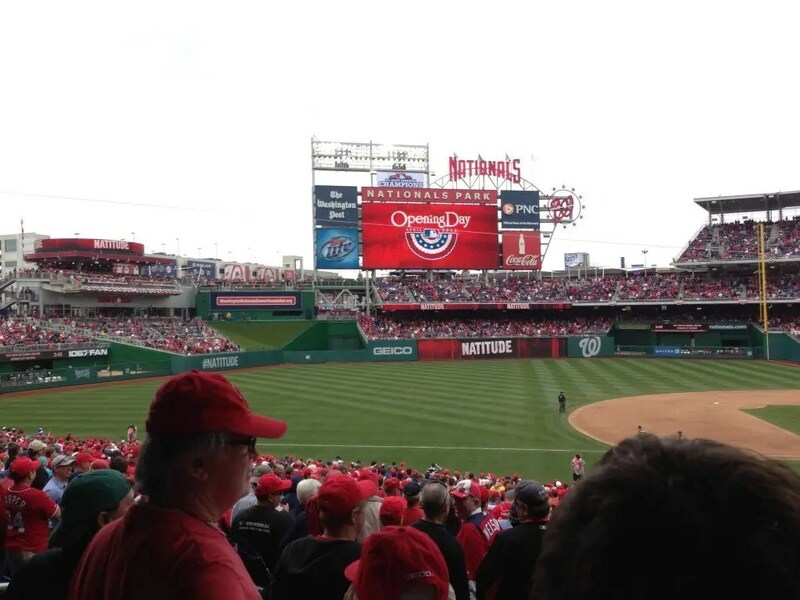 We were on the other side, just in time to see Bryce Harper hit his second solo home run of the day. Dante and I had an amazing time at the ball game. He didn’t quite understand everything that was going on. For example, every cheer was met with the question, “Did we hit a home run?” But he loved watching the scoreboard, especially the pitchers’ pitching speeds (“95 miles per hour!”). And, if you ask him today what the attendance was, he can tell you without hesitation that it was 45,274. While I was writing this post, I was aware that it is World Autism Awareness Day. I don’t need an awareness day; I live with the effects of autism every day. But I thought this post would be a good opportunity to shed light on a day-in-the-life of an autistic child as well as thank that very sweet woman who unsuspectingly made the day of an autistic boy and his mom.